Your hand cleaner that really works! Zeosoft has yet to find an ingrained dirt and/or stain or odour hand our products cannot remove – from oil and grease to adhesives and resins to paint and concrete to fish and farm odours. 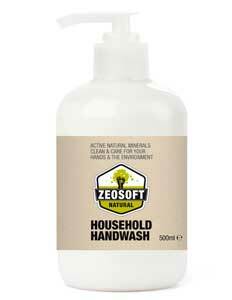 Zeosoft Household Handwash 500ml with pump is 100% natural and formulated for multiple use. Ideal for use in the kitchen and bathroom to gently exfoliate, deodorise, and refresh your hands from regular water use. The Household Handwash not only cleans and refreshes it also removes kitchen and cooking odours plus stains from your hands. These include garlic, fish, beetroot, essences, coffee and many more. 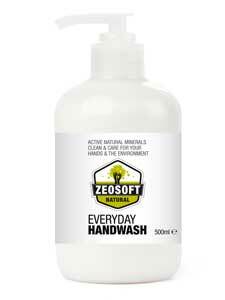 Zeosoft’s natural Everyday Handwash 500ml with pump gently exfoliates and deodories your hands with each wash. Ideal for the small workshop washroom. 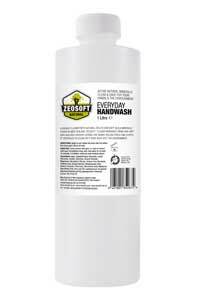 Zeosoft’s Everyday Handwash 1ltr Refill with dispenser gently exfoliates and deodorises your hands ideal for the factory or site washrooms. Zeosoft unique natural and environmentally positive Everyday gel Hand Cleaner is ideal for all the light to moderate hand cleaning and odour removing cleaning tasks. The product has been formuated for regular use moderately dirty dirts without the ingrain dirt and stains plus removes all odors. Plus the product’s essential oils in will help repair your hands and leave them feeling refreshed. The Everyday Hand Cleaner 300gm tube is ideal for the mobile or outdoors worker who needs to carry a hand cleaner with them as part of the job. Zeosoft’s Deep Cleansing Body Soap bar (containing Zeosoft’s Active Natrual Minerals), washes away impurities leaving your skin feeling fresh, supple and revived. Ideal to use in your shower and does not leave any grime on your shower unit. I have been cleaning chimneys for 12 years and this is by far the only soap that cleans and moisturises my skin. 100g bar:$3.75 per bar…..order by mail. 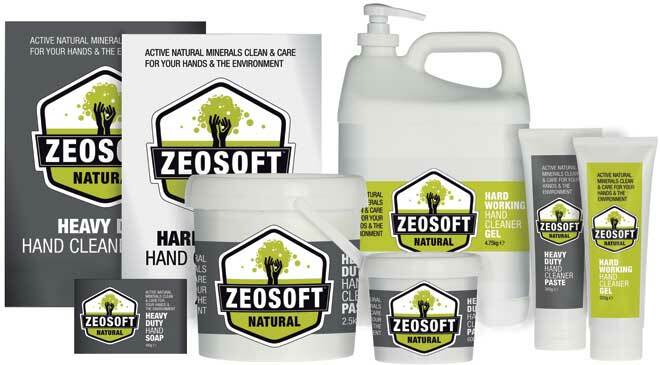 Zeosoft’s Heavy Duty product removes the real tough, difficult to remove, ingrained dirt, grime, stains and odours 100% naturally and leaves your hands repaired and refreshed, Over a broad spectrum of dirty hand cleaning tasks Zeosoft’s Heavy Duty paste is not only a high peformance cleaner it also deodorises, and repairs your hands. Mechanics and body workshops, tyre, paint, engineering, heavy industry, timber, forestry and wood turning, construction, road working, on the farm, flooring, printing, oil and gas, aerospace, utilities, armed services, waste management, rail, marine, concrete, wine and many more. 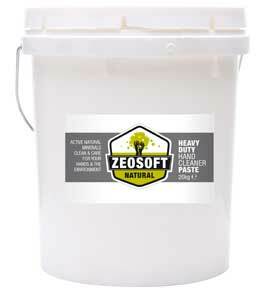 Being NZFSA C51 certified, Zeosoft’s Heavy Duty range can be used in food processing. Zeosoft’s HD300 tube is ideal for the mobile worker who needs to remove the tough ingrained dirt, stains and odours or the home workshop or garage or just to trial the Zeosoft range. Ideal for Mobile Mechanics & Garages. © 2012. Select Home Services. All Rights Reserved.